Published customer image: . 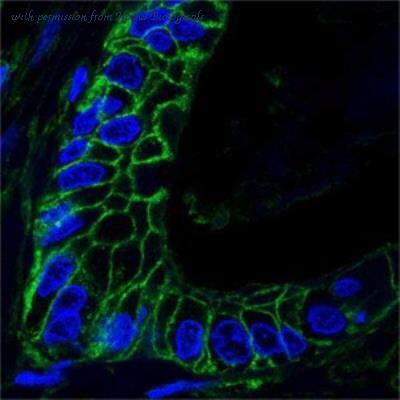 Rat anti Mouse CD44v6 antibody, clone 9A4 ( MCA1967 ) used for the identification of CD44v6 expressing luminal progenitor cells by immunofluorescence. Image caption: . Molecular and phenotypic characteristics of luminal progenitors isolated from virgin and early pregnant females. (A) q-PCR analysis of gene expression levels in mammary Lu-neg and Lu-pos cells isolated from early pregnant females (P-8d). Mean ratios of values normalized to Gapdh expression are shown. Lu-neg/Lu-pos and Lu-pos/Lu-neg ratios are presented in upper and lower panels, respectively. Data are from two independent cell preparations. (B) Icam-1, Met, and Hgf expression in Lu-neg, Lu-pos, and basal/myoepithelial cells, as determined by q-PCR. Cells were isolated from mammary glands of 8-day-pregnant mice. The q-PCR values were normalized to Gapdh expression and represent mean from two independent preparations. (C) Immunodetection of CD44v6 and K8 in cytocentrifuged Lu-neg and Lu-pos cells freshly isolated from mammary glands of mature virgin mice. 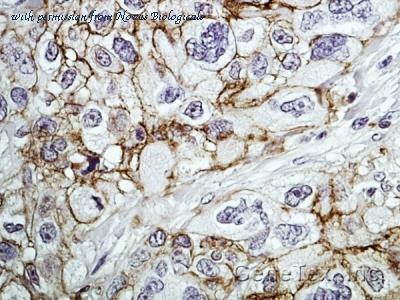 In upper panels, nuclei were stained with DAPI. Bar, 15 um. From: Di-Cicco A, Petit V, Chiche A, Bresson L, Romagnoli M, Orian-Rousseau V, Vivanco Md, Medina D, Faraldo MM, Glukhova MA, Deugnier MA. Paracrine Met signaling triggers epithelial-mesenchymal transition in mammary luminal progenitors, affecting their fate. Elife. 2015 Jul 13;4 . 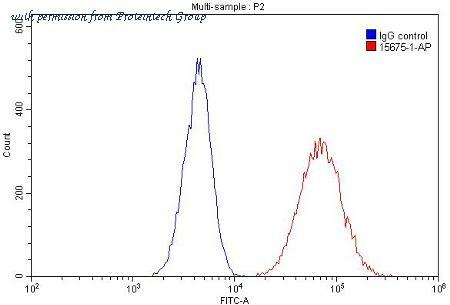 Figure A. RPE conjugated rat anti mouse CD3 ( MCA500PE ) and FITC conjugated mouse IgG1 isotype control ( MCA1209F ). 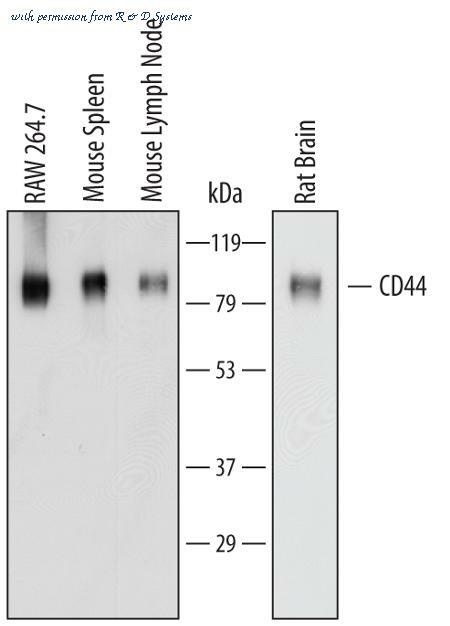 Figure B. RPE conjugated rat anti mouse CD3 ( MCA500PE ) and FITC conjugated mouse anti mouse CD44 ( MCA1014F ). 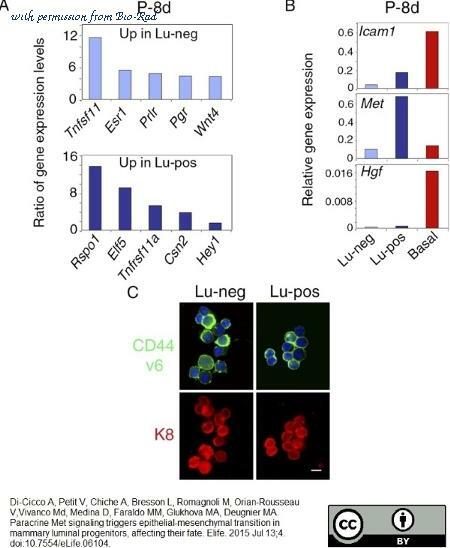 All experiments performed on red cell lysed murine splenocytes gated on lymphocytes in the presence of murine SeroBlock (BUF041A). 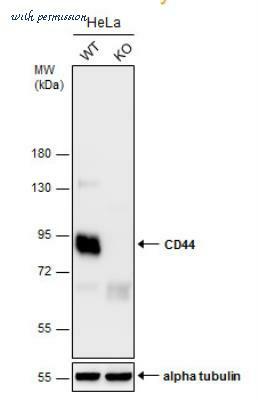 Detection of CD44 in Human PBMCs by Flow Cytometry. 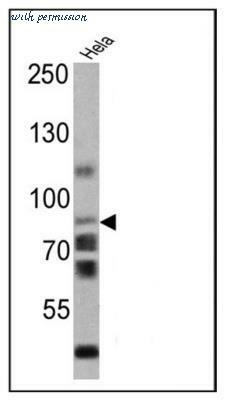 Human peripheral blood mononuclear cells (PBMCs) were stained with Rat Anti-Human/Mouse CD44 Monoclonal Antibody (Catalog # MAB6127, filled histogram) or isotype control antibody (Catalog # MAB0061, open histogram), followed by Phycoerythrin-conjugated Anti-Rat IgG Secondary Antibody (Catalog # F0105B ). 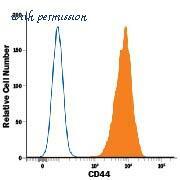 Detection of CD44 in Human PBMCs by Flow Cytometry. 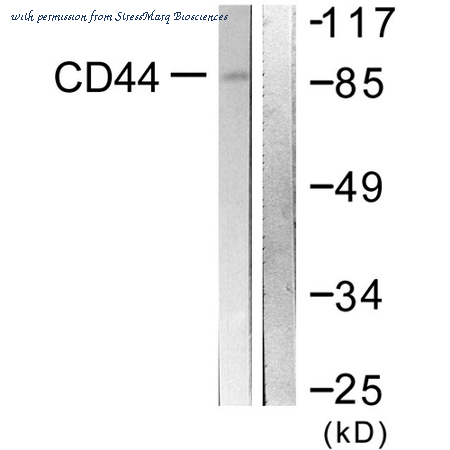 Human peripheral blood mononuclear cell (PBMCs) were stained with Rat Anti-Human/Mouse CD44 Alexa Fluor« 488-conjugated Monoclonal Antibody (Catalog # FAB6127G, filled histogram) or isotype control antibody (Catalog # IC013G, open histogram). View our protocol for Staining Membrane-associated Proteins . 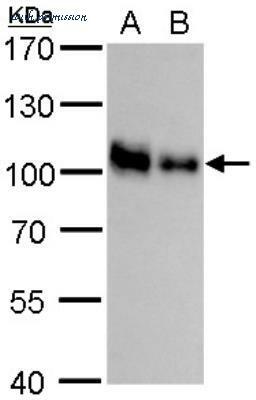 Western Blot: CD44 Antibody (Hermes-1) [NBP2-22530] - of Hela cell lysates. 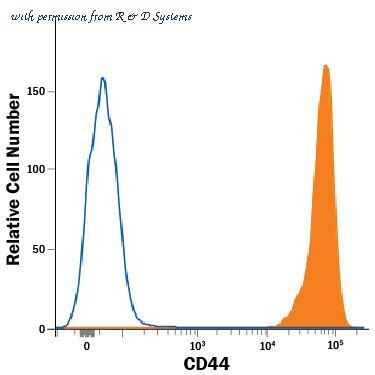 Flow Cytometry: CD44 Antibody (Hermes-1) [NBP2-22530] - Analysis of CD44 in PBMC cells (green) compared to an isotype control (blue). 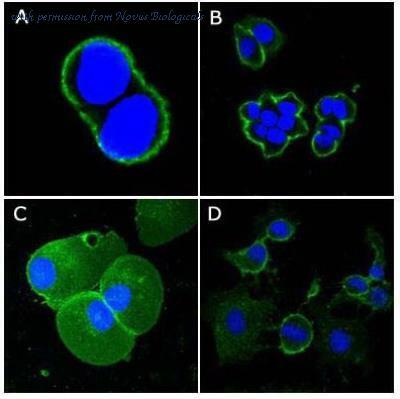 Immunocytochemistry/Immunofluorescence: CD44 Antibody (Hermes-1) [NBP2-22530] - Analysis of CD44 (green) showing staining in the membrane of Hela cells (right) compared to a negative control without primary antibody (left). 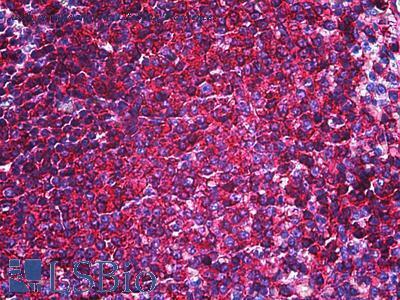 Anti-CD44 antibody IHC of human spleen. Immunohistochemistry of formalin-fixed, paraffin-embedded tissue after heat-induced antigen retrieval. Antibody concentration 10 ug/ml.